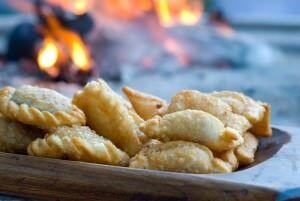 Of all the national dishes on offer throughout the country, empanadas are especially evocative of Argentina food and culture. In this empanada recipe, we’ll be showing you how to prepare ossobuco empanadas topped with hot tomatoes and baked red onion sauce in a recipe by Matias Podesta, one of the leading young chefs in Mendoza. Over the years, Matias has worked in several trendy restaurants in Mendoza such as Dionisio, Park Bistro and Voodoo Bar, to name just a few. 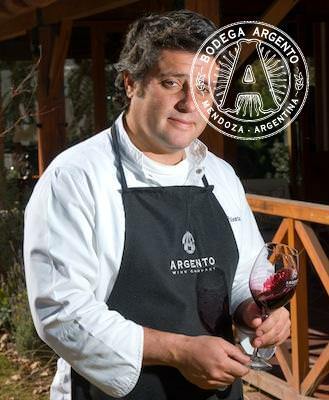 He has also acted as executive chef for several restaurants and wineries in Mendoza, among them the Hotel Huentala and Bodega Septima, and also regularly prepares world-class asados for the guests at Casa Argento, giving him an impressive resume and understanding of both modern and classic Argentine cuisine. 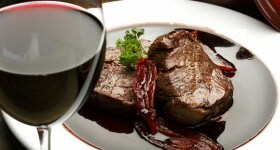 Heat olive oil in a frying pan, cook the ossobuco meat until golden brown and add a pinch of salt and pepper. Add 150g of diced onion, and then add the chopped red pepper, carrots and celery. Add the Malbec wine and let the alcohol evaporate. Add enough water to almost cover the meat, cover and cook on low flame for two and a half hours. When the meat can be easily cut, chop it into small pieces, add the julienned onions, and cook until everything mixes together. Let cool – the filling is now ready. Peel the tomatoes and onions and dice them in small cubes. Heat the olive oil in a pan, add the onion and cook until transparent. Add the tomatoes, chili, oregano and thyme. Cook for 15 minutes adding salt and pepper to taste. Roll the pastry dough flat and cut in 8 circles of approx. 13 cm of diameter, place a tablespoon of filling on one side of the circle. Dip a finger in water and pass it on the edge of half of the pastry. Fold the pastry, press together to close, and you are now ready for the “repulgue” (braiding the edge of the empanada). To fold the repulgue, think of triangles. Start at one corner of the empanada, and fold a triangle of dough from the seal edge down over itself. Press down to seal it, extended that part of the dough a bit as your press on it, and fold down a second triangle right next to the first. Press it down to seal and repeat, continuing all the way around the edge. The last triangle can be tucked underneath the edge if necessary. Brush the empanadas with whisked egg and place on an oven tray. Cook for 12 minutes in a pre-heated oven at 180ºC. 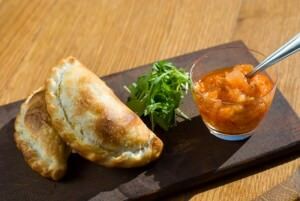 Serve the empanadas accompanied by a small dish of the hot tomatoes and onion sauce – and a big glass of Malbec!